David and Collet Stephan are being criminally prosecuted in Lethbridge, Alberta after their 19 month old died of meningitis and a lung infection. Baby Ezekial was treated with a mixture of natural remedies rather than taken to a medical doctor. DUNDAS, Ontario - March 16, 2016 - PRLog -- The trial against the parents, David and Collet Stephan, is presently underway. The prosecutor claims that when their baby developed a cough, the parents treated him with various home remedies, such as water with maple syrup, juice with frozen berries and finally a mixture of apple cider vinegar, horse radish root, hot peppers, mashed onion, garlic and ginger root as his condition deteriorated. When a nurse suggested to the parents that they take him to a doctor, they instead took him to a naturopath and obtained echinacea in an attempt to strengthen his immune system. When baby Ezekial stopped breathing, an ambulance was called and he was airlifted to Childrens' Hospital in Calgary where he died five days later. The Crown argues that they should have sought medical help much sooner while the Stephans claim they have negative experiences with the medical system and thus prefer naturopaths. The Stephans are not strangers to controversy. Tony Stephan, David's father and Ezekial's grandfather, is the founder of Truehope - a company that promotes its own brand of multivitamins called EM Power Plus which is claimed to cure serious mental illnesses like schizophrenia and bipolar disorder. As part of their treatment regime, they actively encourage their customers to go off their prescribed medications. Since he first heard about this product in 2000, Marvin Ross has been writing about it critically along with his two colleagues, Dr Terry Polevoy, an MD in Waterloo, Ontario, and Ron Reinhold, a private detective in Calgary and a former Health Canada investigator. 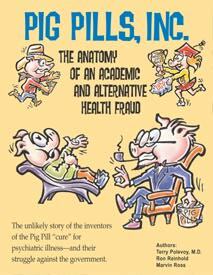 The three produced an e-book called Pig Pills Inc: An Anatomy of an Alternative and Academic Health Fraud which is available on Kindle and Kobo. Twice, Health Canada has issued warnings that this product was a possible health hazard because of potential worsening of psychiatric symptoms and "unauthorized health claims, and medical advice being provided by non-medically qualified staff"
In June of 2012, Jordan Ramsay in North Vancouver, British Columbia was found not criminally responsible for the murder of his father which he committed after going off psychiatric medication for his schizophrenia in favour of EM Power Plus. One newspaper in North Vancouver declared that "Vitamin Therapy contributed to North Vancouver murder, judge". Dr Philip Long, a highly respected Vancouver psychiatrist stated that EM Power Plus is a "total medical fraud. There is absolutely no scientifically sound (double blind, randomized) clinical trial that has shown this vitamin mixture to be effective. It is bad enough that people with mood disorders suffer so terribly. It is criminal that others perpetrate a medical fraud just to prey on the suffering of the depressed." Health Canada had prosecuted Truehope but lost and the reasons for that are outlined in the above blog. The Stephan family are avid believers in their alternative products which they market aggressively. How all this came about and an evaluation of the science (or lack thereof) in their beliefs can be found in Pig Pills Inc: The Anatomy of an Academic and Alternative Health Fraud available on Kindle and Kobo for $4.99.